Where conventional Medicine fails, the traditional Indian teachings of Ayurveda offer relief for many chronic illnesses. The individual and their own personal habits, diet and needs are central in Ayurveda. This millennia-old medical science is the oldest in the world. Something to note, however, is that Ayurveda treatment is no relaxing holiday, but rather hard work for the patient as well as the Ayurveda doctor and the therapists. Traditional Panchakarma treatments can be divided into three stages: Purvakarma – the preparation, Panchakarma – the main treatment, and finally Rasayana – the aftercare. During an initial consultation with an Ayurveda doctor, the condition of your Dosha as well as your body type is determined through a pulse reading. An individual treatment and diet plan are then agreed upon. Waste products within the body tissues are activated through cleansing methods, which can include Ayurvedic oil massages (Abhyanga), forehead oil treatment (Shirodhara) and sweating cures (Swedana). Next up are the finishing techniques that are supposed to flush the excess Doshas out of your body as toxins. The techniques include nasal and sinus treatments (Nasya), medical purgation (Virechana) and blood purification (Raktamokshana). The aftercare depends most of all on the recovery and the inner contemplation of the patient, reasons for which yoga and meditation are used in addition to ayurvedic rejuvenating cures. Ayurvedic medicines are not an integral part of ayurvedic treatments, but rather supplementary. All ayurvedic treatments can be carried out without the use of medicines, and still have the same success. It’s more about individual cleansing treatments that flush the waste products (Arna) from the body during the Panchakarma, and also to rebalance the body’s Doshas. Ayurvedic medicines can still support the cleansing process, however. This type of medicine is based on herbalism, with over 3000 different plants and herbs that are grown and mixed under strict quality control, often through in-house manufacturing. Our partner hotels only use harmless plant based herbal mixtures. The fundamental principle of traditional Ayurveda teachings is based on a holistic treatment through consultations and monitoring by experienced Ayurveda therapists. A course of ayurvedic therapy usually lasts between 3 and 12 weeks, and should therefore be supervised by a qualified team. Never self medicate Ayurvedic medicines, especially without consultation with a ayurvedic therapist, and do not order any medicines on the internet. Unfortunately there are more and more cases of defective products sold on untrustworthy websites. Seek advice from an Ayurveda therapist and only book appointments with experienced specialists such as SpaDreams. Our experts will be happy to help you further. Ayurveda therapy is not a relaxing break, but rather a treatment that combines a strict diet plan, meditation and diverse treatments that are supposed to prevent or relieve illnesses. Only book Ayurveda therapies through experts in order to ensure that the highest standards of quality and continuous reviewing processes are practised in the health resorts. Many resorts only serve vegetarian meals and alcohol is for the most part neither available, nor desired, as it can negatively impact on the treatment. In order to complement the cleansing effects of the treatments, herbal medicines can be prescribed. However this is not obligatory, but it is simply a supplement. If in doubt, ask about the usage of herbal medicines. 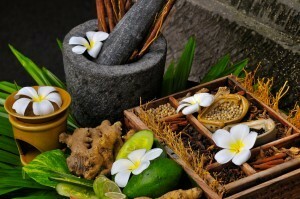 Want to know more about Ayurveda?